Preview: Head coach P.J. Fleck has done a tremendous job in his 2 seasons at Western Michigan, turning the squad from a 1 win team in 2013 to 8 wins last season. Western Michigan was one of the more consistent covering teams in 2014, but now the odds makers know how good this team can be, especially with 16 returning starters back in the fold. Western Michigan has done an amazing job on the recruiting trail for a MAC team and the young talent has already started making an impact for the Broncos. This team looks set up for success for the foreseeable feature. Western Michigan had a revival on the offensive side of the ball in 2014 and with 9 returning starters this unit only figures to be better in 2015. The Broncos found their QB with Zach Terrell who showed great promise throughout his first year as the starter. The O-line returns 3 starters to a unit that has experience, but the offense is looking to a true freshman to start at center. The run game should continue to excel with Jarvion Franklin back after a freshman campaign where he put up over 1,500 yards and 24 TDs. Look for QB Terrell to put up even better numbers this season with his top two options, Davis and Braverman, back in the mix at receiver. Western Michigan’s defense has some gaps to fill, but this unit has some experience with 7 returning starters coming back. The defense loses leaders like Celscar, Currie, and Ash, and it’ll be interesting to see how this unit overcomes those losses. The D-line returns 3 starters and these guys will be called upon to do more with Michigan transfer Richard Ash moving on after a great senior campaign. 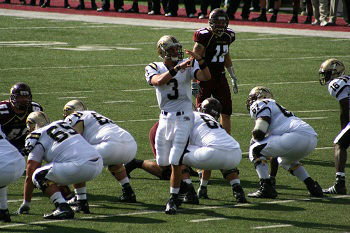 The LB corps also returns experience with all 3 starters back in the mix and this unit will build around Grant DePalma. Even with just 1 starter back in the secondary this unit is still expected to be strong and will work around talented guys like Zamort, Atkins, and Phillips. Prediction: The Broncos got on a hot streak through the middle of last season before closer the year on back to back losses against Northern Illinois and Air Force. Picking up 8 wins was still a great sign for this young team coming off a 1 win campaign the year prior. We’ll get a great idea of where this team is headed right out of the gate with a home game coming against Michigan State followed by a tough road game against Georgia Southern. Western Michigan is looking to build themselves into a consistent MAC West contender and they should be right there with Toledo and Northern Illinois and this season.